Independence Pass is closed to cars before Memorial Day weekend. Therefore we’ve created an annual road-riding excursion to Aspen the weekend prior. The team rents condos – 3 were needed in 2018! – while some ladies stay in hotels or with local friends. We all meet up for rides and meals. 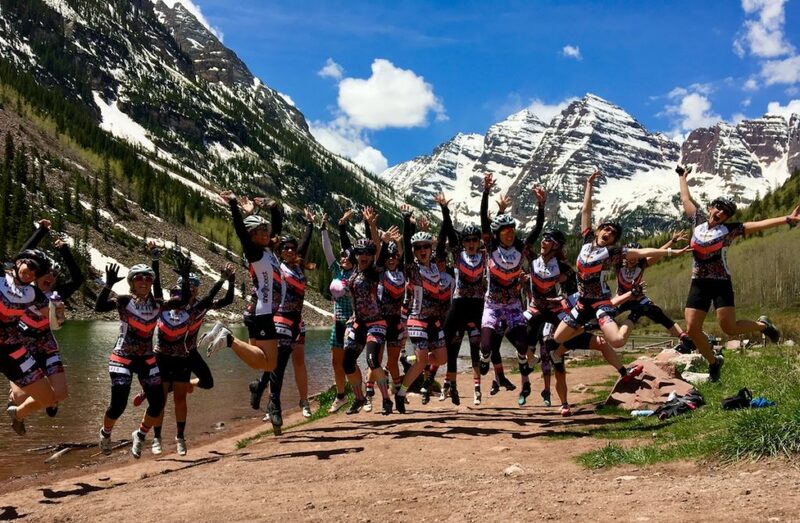 On Saturday we pedal up to the Maroon Bells. After a celebratory photo session we cycle through Snowmass to the Woody Creek Tavern for lunch and margs. Sunday presents the big gig: an out-and-back to the summit of Independence Pass. Those who don’t want that magnitude of a ride do their own thing by riding the Rio Grande Trail from Aspen toward Carbondale. This is an incredibly beautiful area to ride in and is perfect for all rider levels. 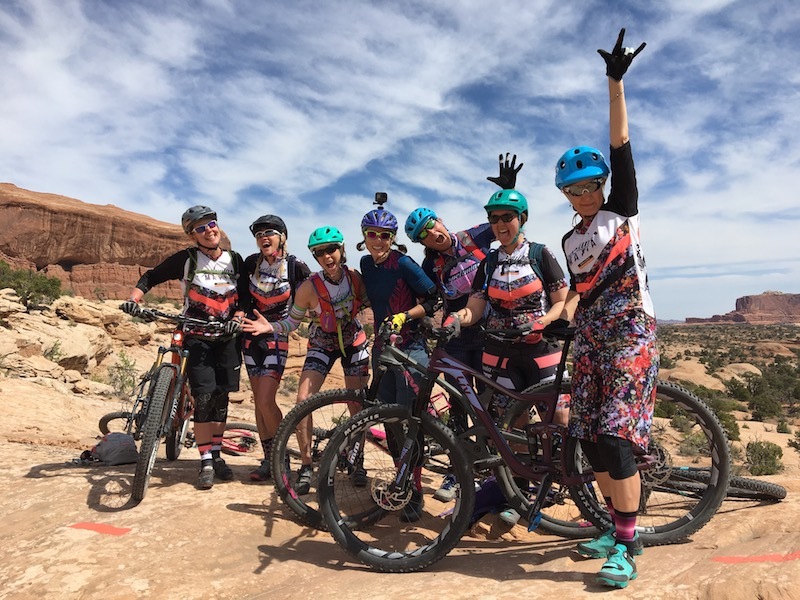 Mountain bikers rejoice at the thought of a weekend in the cyclist’s mecca of Moab. The team reserves a group camp site one year in advance to be sure we get the campground of our choice. Team leaders organize the trip to epic proportions: carpools, shared camping gear, rides for different ability levels, and even a shuttle service to bag Porcupine Rim. For those who love NOT camping, they grab their own lodging in town and just meet up at trailheads. Since it’s a haul to get from CO’s Front Range to Moab, this is at least a 4-night weekend. Some folks have to arrive a day late or leave early, and that’s OK. We’ve learned things over the years so in 2019 the Moab trip is recommended for blue (intermediate level) riders to black (advanced). For a couple of years we’ve ridden up the old access road from Rollinsville to the peak of Rollins Pass and back. In 2018, that option remained and we added a “credit card trip” component. 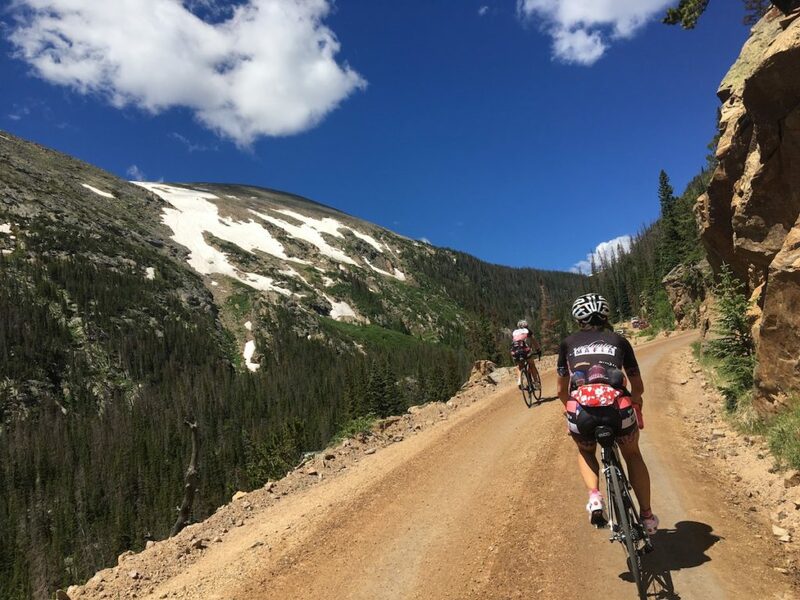 Those who wished to stay overnight in Winter Park and cycle back over the pass on Sunday made a night of it with what they carried on their bike and back – generally as little as possible and you buy what you need with a credit card. There’s so much to explore in Colorado’s high country. Summit, Eagle, and Mesa counties beckon us on both road and mountain bikes. We have some one-day events where we’ll just meet up at the destination for the day and not plan lodging. We also have weekends where we’ll reserve a condo and plan rides. 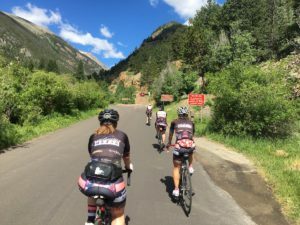 Past rides have included road rides over Vail Pass, around Lake Dillon with a Montezuma offshoot, and our own version of the Copper Triangle. 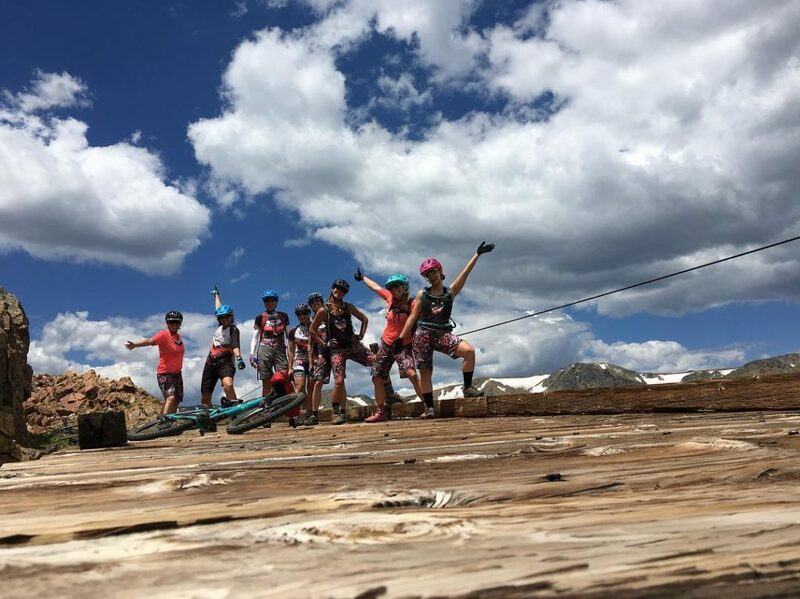 Mountain bikers have hooked up for a singletrack day near Breck, Vail, Buffalo Creek, Fruita, Eagle, and other locales. A woman’s got a right to change her mind, so we keep our options open and add trips to our calendar as desired or requested.